Nuclear does NOT mean bomb! South Africa needs a library of its uranium reserves in order to be able to trace the origins of nuclear material, and the North-West University’s (NWU’s) Centre for Applied Radiation Science and Technology (CARST) is playing a leading role towards this goal. Prof Manny Mathuthu from CARST delivered his inaugural lecture in front of a packed audience at the NWU’s campus in Mahikeng campus on 19 July 2018. A professor appointed at the NWU is mandated to deliver such an address within one year from the date of appointment as a full professor. Titled “The Role of Nuclear Science in National Security – Nuclear does not mean bomb!”, Prof Mathuthu deplored the lack of public knowledge about nuclear science and its application. He said South Africans are generally afraid of nuclear because they fear the effects of radiation and the consequences of nuclear terrorism, for example the 2011 Twin Towers bombings in America. “Let’s not focus our minds on this negativity and ignore the true benefits of nuclear. Nuclear is not the problem - the problem is man’s desire to be superior to the next,” he said. According to Prof Mathuthu, South Africa is a signatory to a treaty to reduce its carbon emissions by 50% by 2025. Prof Mathuthu also believes that South Africa’s uranium deposits are a resource that must be protected and preserved. Prof Mathuthu said he is proud of CARST staff who have, between 2012 to 2017, produced 25 peer-reviewed articles, participated and represented the NWU at local and international conferences and produced a number of master’s and doctoral graduates. *Prof Mathuthu is a full professor at CARST and obtained his PhD in nuclear and plasma physics from the University of Zimbabwe in 1998. 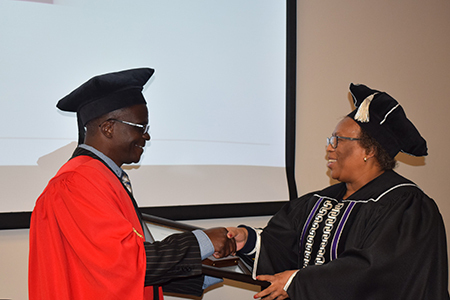 Prof Marilyn Setlalentoa, the deputy vice-chancellor for operations on the campus in Mahikeng, congratulates Prof Manny Mathuthu after the delivery of his inaugural lecture.